I guess your MacBook doesn't support AVB. I thought every Mac with a Thunderbolt port also has AVB support, but as far as I know, a Macbook 4.1 ain't got Thunderbolt. I think your question is more likely: Can I use the CS18Ai with the SW5E to record audio to my Mac? The SW5E works for switching AVB devices and works with the CS18Ai and RM Series, as well as any IEEE 1722 or IEEE 1722.1 compliant devices, not just from PreSonus. 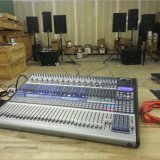 However, the StudioLive CS18Ai is an AVB 1722 device (not 1722.1), the CS18Ai / RMAi Mixer system is based on the IEEE 1722 protocol however it does not support recording audio to the computer from the AVB network while connected through the SW5E switch. On this system you'd still need to connect a 1394 cable from the Ai Mixer to record audio into the computer. Series III Mixers support recording from AVB to the computer either directly or while connected through the SW5E switch. Do I need an AVB switch? Do the headphones connected to the CS28AI work if it is not AVB connected?